Line a baking sheet with a silpat (silicone) mat or parchment paper and set aside. Set up a double boiler on your stove top and melt the dark chocolate until there are just a few small pieces left un-melted. Remove from heat and stir with a rubber spatula until completely melted and smooth. Then pour the dark chocolate onto the lined baking sheet. Act quickly to spread it out evenly using an offset spatula until your desired thickness has been achieved. Then place it in the freezer to set, up to 20 minutes. Meanwhile, place the white chocolate in a glass, microwave safe bowl. Microwave for 15 second intervals, stirring in between with a rubber spatula until there are just a few small pieces left unmelted. Be sure not to burn the white chocolate. Stir until all of the white chocolate has melted and is completely smooth. Then stir in the cake mix until well combined. Pour the white chocolate on top of the dark chocolate layer. Use an offset spatula to spread it out ovenly over the dark chocolate, without spilling over the edges, until your desired thickness has been achieved. Immediately top with as few or as many sprinkles as you’d like. 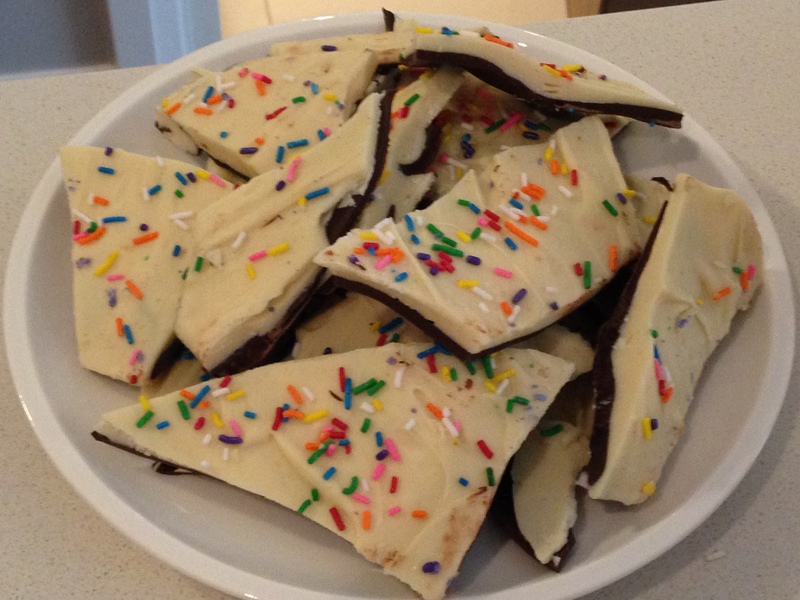 Then return the chocolate bark to the freezer until it sets all the way through, up to 20 minutes. Once the chocolate has set, break it up using your hands or cut it into pieces. Store in an airtight container in the refrigerator.